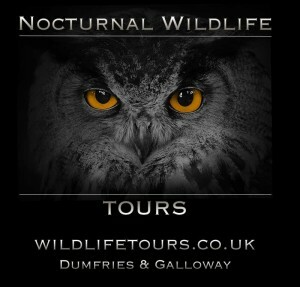 Nocturnal Wildlife Tour, Castle Douglas – Technology Meets Wildlife, Up Close! We had set off early from Lanarkshire that day and had spent most of our time walking / birdwatching at Caerlaverock WWT trust and so were pretty tired when we arrived at Castle Douglas for our long weekend. It was around 5pm and we were staying at Lochside Apartments, which as luck would have it, was only a 5 minute walk from the Nocturnal Wildlife Tours (NWT) main office. You’d have thought we had planned that – well done Linda. We had been advised to meet up at 6pm at the NWT office for an introductory session before our tour started and to come prepared for wet weather. 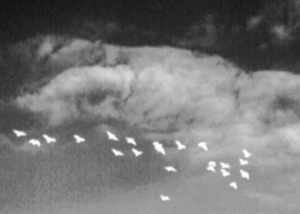 It was a cold, slightly windy and crisp night, but it was dry and the forecast looked pretty good. We have taken part in many wildlife tours over the years, but we really didn’t know what to expect and were quite excited, so much so, we arrived 20 minutes early. We had kitted ourselves out in as much dark gear as we could; we were taking this night mission seriously. We did although resist the temptation to paint our faces with camouflage paint! We arrived that early we met up with Keith on Castle Douglas Main Street as he was opening up for the evening.? Keith was the ‘TV star’ we had seen earlier in the week on BBC Autumnwatch demonstrating the equipment they use and what they get up to on the tour. Keith has been a wildlife ranger for over 35 years and is really passionate about what he does, the area and photography / filmmaking in general. The NWT office, at the rear of a narrow lane, is what we expected being bright, modern and the walls adorned with wildlife images and technology. Another couple were joining us, but Keith was so keen he started to give us a run down on the night ahead before they arrived. Cowan arrived shortly before the other couple; he is the technology / technical guru (and driver!) and his knowledge and experience coupled with Keith’s wildlife experience proved a great partnership. So we could get started Keith nipped outside to find the other couple, who were seemingly ‘internet bloggers’ – sorry Keith that was us! We were all issued with a hand held thermal camera which was central to the tour. It allows you to detect a heat source as small as a mouse, or something as big as a red deer stag at distances of up to 950m at night. 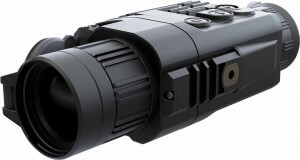 Unlike traditional night vision devices, this device is not affected by objects such as bushes or grass, or adverse weather conditions such as fog or rain. The device sees the infrared energy emitted from objects both natural and man made and images are displayed on a viewfinder. The devices could display white heat, or black heat, depending on the background and the surrounding temperature. After a 15 minute introductory session on how the devices and equipment worked, including the customary health and safety briefing we were all set. We left the offices suited, booted and with equipment that wouldn’t look out of place in an episode of Strikeback. 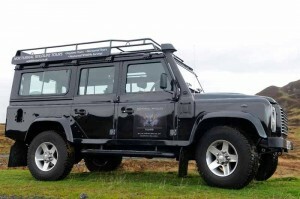 We boarded the NWT Landrover which again was kitted out with all the gadgets – Cowan and Keith really are ‘boys with their toys!’ The Landrover had an on-board thermal camera which allowed us to track and locate wildlife on the way to Threave Estate. 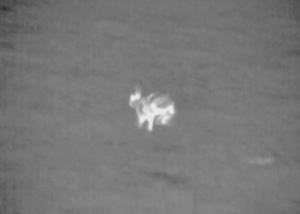 The thermal camera located on the roof of the vehicle, had a 360 degrees view of our surroundings and wildlife which would normally go undetected by the human eye. 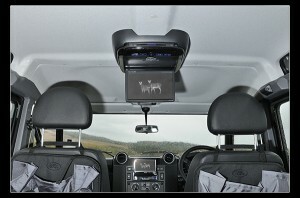 Within the vehicle two LCD displays allowed us to view the action as we drove along. Colin had managed to bag the front seat and had responsibility for pushing the zoom button function for the roof mounted camera – you would have thought he was holding the button to a rocket launcher given how much he talked about! Have to say it was a pretty cold night and viewing the images from inside seemed a much better idea than venturing out, but hey, we were SAS soldiers after all and needs must!Top tip though, when it’s cold, take thin / warm gloves as some of the camera buttons can be a little fiddly. We had a few stops en-route to and from the Threave Estate to try out the cameras. Keith and Cowan were fantastic and knew the area very well and where best to look for wildlife. They used the same equipment, along with some new gear they were trialling, to find wildlife for us. Although, pleased to say we did manage to track down ourselves some foxes, badgers and what we think was a hare. It’s a bit of a balance for the NWT guys on where best to take people, given peoples’ capabilities and potential weather conditions. Threave Estate was a safe bet given the weather; the paths were pretty level and straight and there were only a few puddles to negotiate. On a normal afternoon, they wouldn’t have been too much of a challenge, but in the deepest dark of night they still proved to be quite ‘interesting’. Perhaps something for the NWT team to consider in the future would be to ask people to gauge their capabilities before they arrive so they can take them out on the most appropriate trip. Although, perhaps a little tame for us, we really enjoyed Threave Estate and it was perfect for our first night time experience. We knew it was going to be dark, but we hadn’t appreciate just how dark. In some places it was solid black, with the only glimpse of light from the stunning (and we have to say again, stunning!) Galloway night sky. The Milky Way directly above us, was so clear and vivid and, if we hadn’t been in the possession of about £2.5k of gadgets to play with, simply staring upwards would have been a great night in itself. It was also so dark we lost count of how many times we started talking to each other about what we had seen, only to realise it was someone else or there was nobody actually there. Overall we managed to track down over 10 different species, including foxes, red deer, roe deer, badgers, field mice, rabbits, hares, small birds hunkered down for the night and various water birds. 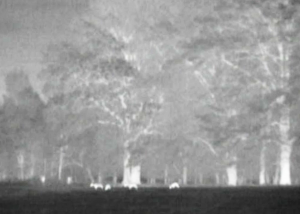 These animals are not uncommon, but it was observing them in their natural surroundings at night that made this special. We knew they were there, but they didn’t necessarily know we were there too! Have to say the most exciting experience was being less than 2 feet away from a small Dunnock hunkered down in the brambles sheltering from the cold, protecting itself from predators. He was sound and had no idea we were so close – he just looked like a white tennis ball in the bushes. 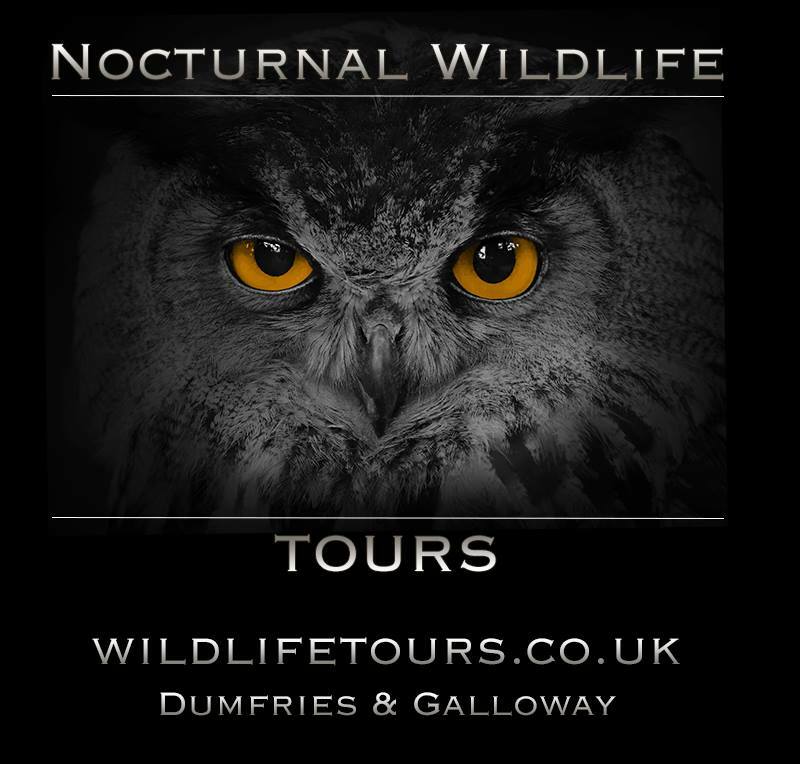 Nocturnal Wildlife Tours were recently nominated for the Dumfries and Galloway ‘Most Promising Developing Business’ award and we can really see why. Keith and Cowan have only been doing this for just over 8 months and they have really stumbled onto something special here. We’ll certainly be back, albeit it on a slightly warmer evening! We should also have said that you could record video on the thermal devices, but we’re afraid our filming skills were abysmal! Top tip is to simply enjoy the experience and, if you get any good footage that’s a bonus, if not you’ll have great memories. See for yourself here! 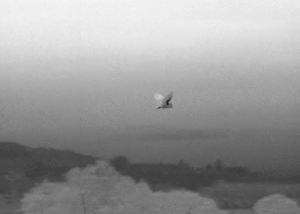 Quality of filming and screenshots above don’t match the top quality experience we had, but I blame the cameraman! Top marks to Keith for making the footage look not too bad at all though. 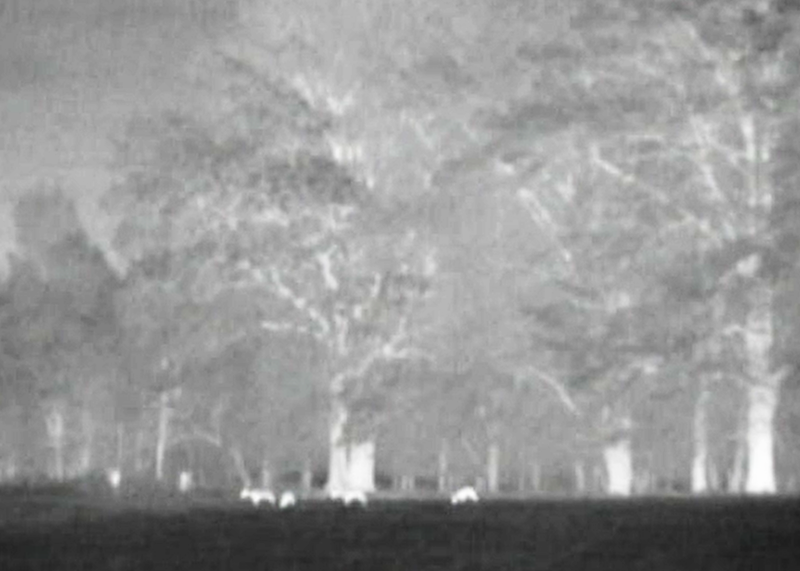 Bear in mind people these images are taken in complete darkness. Watch out for NWT? on the BBC’s One Show in the coming weeks.